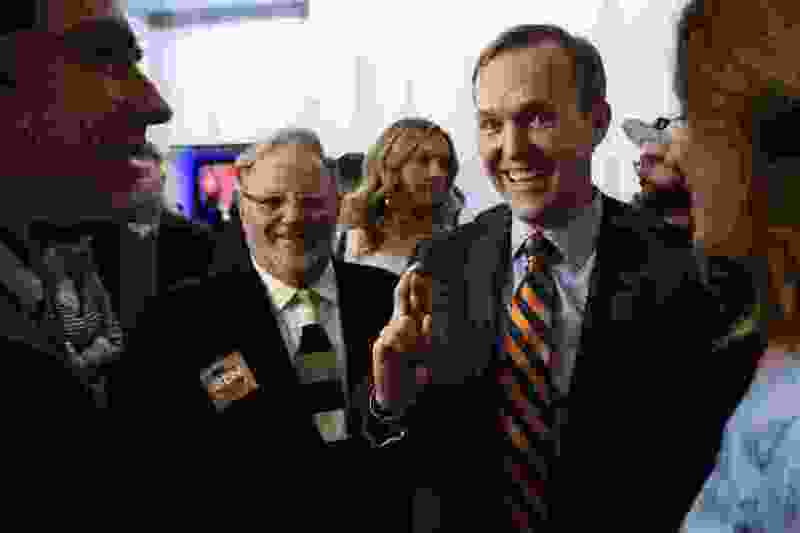 (Alex Goodlett | The Associated Press) In this Nov. 6, 2018, file photo Salt Lake County Mayor Ben McAdams, Democratic candidate for Utah's 4th Congressional District, speaks to supporters during an election night party, in Salt Lake City. Republican U.S. Rep. Mia Love has cut into McAdams' lead as vote-counting continues in the race that remains too close to call a week after Election Day. Democratic Salt Lake County Mayor Ben McAdams declared victory Monday in his race against GOP Rep. Mia Love — after he gained a 739-vote lead in ballot updates from Utah and Salt Lake counties. Love did not yet concede, and a few votes still remain uncounted in the two big counties before their vote canvasses Tuesday formally conclude two weeks of tallying ballots. But McAdams said even his small lead is insurmountable with the few ballots remaining to be counted. Meanwhile, Love issued a written statement that did not concede, and suggested she will wait for the canvass Tuesday. “I would like to express my sincere appreciation to the voters, who along with our family, have been waiting for two weeks to get election results. Thank you for your continued participation in this process,” she wrote. McAdams now is ahead by a 50.14 percent to 49.86 percent margin. Salt Lake County Clerk Sherrie Swensen and Chief Deputy Utah County Clerk Auditor Scott Hogensen said their counties have now completed counting all votes — except for some by-mail ballots that had been received without required signatures, or where the signatures did not appear to match those on file. Those voters were given the opportunity to remedy problems by submitting affidavits with their signature, but they had to be delivered to county clerks by 5 p.m. on Monday. Swensen said the number yet to be counted in her county was relatively small. Hogensen said simply he did not know how many votes remain uncounted in Utah County. The Utah County Commission has scheduled its canvass for 3 p.m. on Tuesday, and the Salt Lake County Council will hold its canvass at 4 p.m. The 4th District also contains small Juab and Sanpete counties. The state will hold a canvass Monday at noon to certify final results for all such multicounty races. McAdams said he had not talked to Love before declaring victory. Traditionally, candidates wait for their opponents to concede before doing that. But McAdams said, “Traditionally, we don’t wait for two weeks after the election to get results,” and he is anxious to begin work. “My priorities are to begin immediately reaching out to the Republicans, independents and Democrats in this district, to reach out and address the tough challenges we face as a state and a country,” he said. McAdams said his first expected piece of business will be to “hold a town hall meeting to listen to the voters to allow them to tell me their priorities” — which may have been a swipe at Love, whom he has attacked for not holding traditional town hall meetings. McAdams did salute Love for her service in Congress, but also said the tough, negative campaign has been hard on his family. "It has been a roller-coaster ride, especially with the attack ads that you saw from the Love campaign distorting my record,” he said. Love’s campaign had similarly complained about McAdams' and his supporters' negative ads. She is out of state for Thanksgiving, and plans not to give any interview until after the holiday — but plans to issue written statements, her campaign said. McAdams, meanwhile, has been acting much like a congressman-elect. After spending last week in Washington, attending freshman orientation, he signed a letter with 15 Democratic members of Congress pledging to vote against Nancy Pelosi as House speaker when Democrats take control of the House in January. He had pledged to oppose Pelosi throughout his campaign. If the final race margin falls within 0.25 percent — it is now just outside that, with a 0.28 margin — the loser may formally request a recount after the state canvass Monday, said Justin Lee, state elections director for Lt. Gov. Spencer Cox. McAdams said he is confident no recount will occur. If it does, Swensen said the process could require several days — and would include rescanning paper ballots sent by mail, tallying them again by computer, and also rerunning through computers the tapes from voting machines used for in-person voting. No hand counting would be used. “It still would take at least several days,” she said. If a countywide recount — not just one in the portion of the county including the 4th District — is triggered by the also-close Proposition 4 race, Swensen said the process could take two weeks. Love has been in some other close races. In 2012, she lost to then-incumbent Jim Matheson by just 768 votes. Love won in 2014 by 7,511 votes over Democrat Doug Owens. In 2016, she won by a comfortable 34,184 votes also over Owens. McAdams and Love waged one of the state’s most bitter and expensive campaigns ever — costing nearly $10.5 million. Plenty of outside money and ads poured in as the race was seen as key to Democratic efforts to take control of the U.S. House. Love had attacked McAdams for not living in the 4th District — he lives just outside its boundaries. But McAdams countered that 85 percent of the district’s voters live in Salt Lake County, where he is mayor, and charged that Love, a Utah County resident, has not paid enough attention to their needs. McAdams also attacked Love after the Federal Election Commission raised questions about the legality of her raising $1 million for a primary election she never faced. It eventually gave her emails that she said exonerated her, and she called for McAdams to withdraw from the race for his “unethical” ads on the issue. The negative tone of the contest came even though the families of McAdams and Love were close for years, and went to movies, dinners and sporting events together. The friendship crashed to an end when McAdams challenged Love. She said he told her he had no such plans.